Dog, cat, sheep, fox, hen, Pokémon — we don’t only classify animals and their surrogates, but animals are a primary means by which we develop the very idea of categories — and their denial. That’s the main thesis of Paul Shepard’s fascinating book: The Others: How Animals Made Us Human. Shepard argues that animals are “unusual parts of our environment in that they are radically different from people and from each other.” The fact also that animals move and have differentiated “anatomical properties” makes them prime candidates for categorisation (46), and categorisation is an essential component of what we think of as thinking. So parents, teachers and the authors of children’s books instinctively teach infants about animals. In the process they teach children about how categorisation works: through differentiation, features, properties, etc, which in turn is teaching them to think. For shepard it’s not just convenience or some immediate usefulness that draws us to animals as vehicles for this learning about classification, but our primordial affinity, and our co-evolution in a universe of animals, traceable to the imperative to hunt, evade, co-habit and survive. Further evidence of this classificatory imperative resides in the impulse to collect and sort: sea shells, pebbles, eggs, tropical fish, and of course dead beetles, butterflies, stags’ heads, and hides, formally or informally, in musty boxes, on mantlepieces, in albums and museum display cases, not to mention countless pictures of animals and their cartoon representations. Of more interest perhaps, animals, feature as the quintessential breakers of categories, in part contributing to their fascination to us. A fascination, again, traceable to the need to sort and discriminate in order to ensure our ascent amongst surviving populations and species. Shepard describes the fox as a boundary crosser, in that it is a dog (canid) but at the same time has feline qualities; it barks and makes a meowing sound. It roams across the countryside and urban gardens and hunts by stealth. He also notes that “it is hunted yet not eaten” (61). Dogs are also in any case occupiers of the boundary. Undomesticated they live on the outskirts of settlements. They live off carcasses, and engage in other unsavoury habits that pet owners prefer to ignore. “Just as edgeless entities threaten visual chaos, types without borders, ambiguous in their relationships, subvert cognition. Animals and people who are not clearly classifiable may become the object of anathema as signs of corruption or disarray, or they may be seen as sacred mediators, but in either case the dubious forms create excitement, thoughtful deliberation, and a rich mine of metaphorical ore.” (60). He says that we humans are also “edge animals”: “As apes, dog-heads, yetis, fallen angels, diverse races, and emergent androids lurk in the margins of our identity, our species is beset with a problem of the categorical imagination” (68). So animals loom large in the human capacity to think, to problematise, and to think about the problems of thinking. 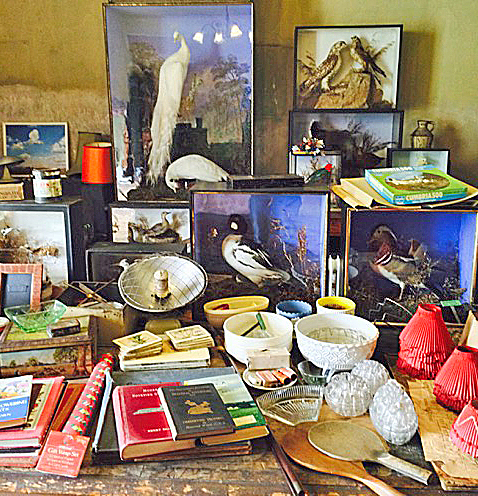 First image is of a tableau of collectibles in Bodsworth Hall, near Doncaster. The video is urban foxes in Edinburgh. Also see Howling at the moon, and Why cartoons have animals.